(Photo by Darren Andrew Weimert) Sam Galt works on a fly. (Photo by Darren Andrew Weimert) Dennis Charney ties a fly. For Centre County fly-fishing legend Joe Humphreys, tying his own flies all started with a fish that he just couldn’t catch when he was a young boy. “It was a 14-inch trout that was hanging out under a rock on Thompson’s Run. I tried to get it with some regular bait, but I spooked it. I just couldn’t get that fish, so I watched it and I studied it” says Humphreys. He saw that it was eating freshwater shrimp. These shrimp are part of the ecosystem that make Centre County one of the best trout-fishing areas in the country, and Humphreys noted some of them had an orange color. The rest is Centre County fishing history. Young Humphries went home and took some orange thread he found in his mom’s sewing kit and tied his very first handmade lure. He went back soon after with this homemade bait and caught that fish. Fish have instincts, notes fly fisherman Sam Galt. They know, Galt says, what types of flies are hatching, and what they look like. It is up to fishermen such as Galt to try to imitate what they think the fish might be looking for. “You try to get into the fish’s head,” he says. Using animal fur and feather strands, along with some synthetic material like thread, fly fishermen tie flies onto their hooks hoping to trick fish into thinking they are getting a delicious morsel instead of some thread tied around a hook. The fishermen wind and they tie. It’s a very delicate process. But Galt would rather not fish any other way. Galt, a Philadelphia native, always loved fish and nature. While all his friends were out playing basketball and hop-scotch on the playground, Galt could be found in streams or creeks, turning over rocks, looking for crayfish and frogs. A 2002 Penn State grad, Galt learned to fly-fish from a fellow student. After a brief hiatus in Chicago, “following a pretty girl,” he came back to State College. Now, he just can’t get away from Centre County and all the beauty that is here. Galt fishes at least 200 days a year, and works at TCO Fly Shop on East College Avenue. He says there is no other place he would rather be. “The fishing here is some of the best in the country. I love it; the streams, the water, it is just beautiful. I can get out there and fish most days of the week, all year long,” Galt says. “I like to say it’s like arts and crafts for adults,” says George Costa. He is a manager at the TCO Fly Shop, where they run a Brew and Bugs fly-tying class on Thursday nights from 6-8. Costa says the well-attended class offers newcomers a chance to learn the skill of fly-tying, and more experienced flytiers a chance to share what they know. 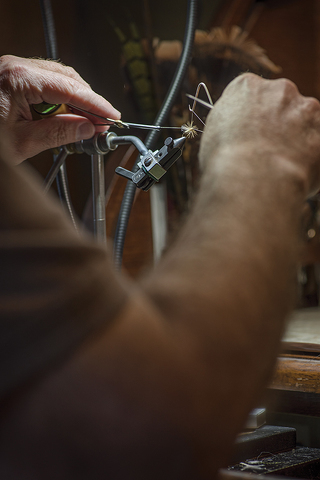 Galt says there are two schools of thought on fly-tying: realism and impressionism. Realists are trying their best to create a fly that comes as close to the real thing as possible. This can be a painstaking process of studying and tying an exact replica of a fly. The process can take more than an hour. Impressionists are looking to study the fly and its natural world, seeking to create a fly that will trick a fish into believing it has caught the real thing, says Galt. “You want to create a sense of motion that will draw the fish to the fly. It really can be an art form, when you are tying your fly, when you are out on the water, working with the rhythms of nature,” he says. Dennis Charney started fly-fishing 20 years ago, and it changed his life. He remembers the first time he caught a fish from a stream with a fly that he made. 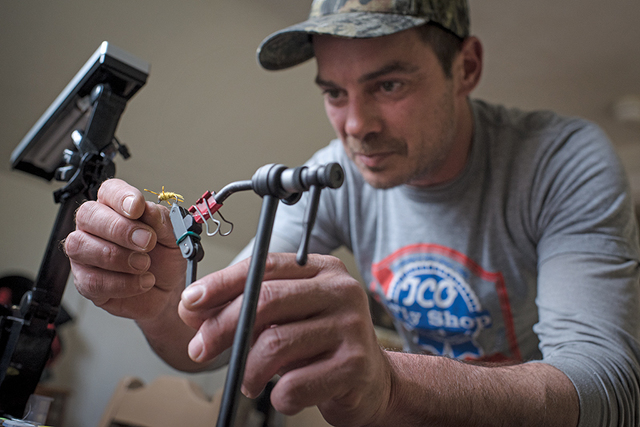 Charney spends his winters working at Flyfisher’s Paradise, also on East College Avenue, tying flies for the upcoming season. The shop caries thousands of fly varieties, and Charney and the crew spend the winter getting ready for the onslaught of fishers who start to flood in around the start of trout season, April 14 this year in Centre County. In his spare time, Charney stocks his fly box, because come the busy season he will be out on the water five to six days a week as a guide teaching people how and where to fly-fish. “Once the season begins, I have no time to tie. Out there on the water I don’t have the time to be tying a fly. I’m too busy fishing and teaching,” Charney says. Charney loves being out on the water teaching people how to fly-fish. Charney spent 20 years working on recording equipment in northern New Jersey. While the intricate hand-eye coordination that comes in handy with electronics helps when tying flies, the scenery he sees fishing streams in central Pennsylvania is nothing like his old life in New Jersey. His family moved to Bellefonte 20 years ago, and hasn’t looked back. While he still works a few electronics jobs here and there, fishing is his business now, and he wouldn’t have it any other way. “Whether I’m tying flies, or out there on the water teaching people how to fish, life is good,” Charney says. Penn State has had fly-fishing classes since George Harvey, the “Dean of American Fly-Fishing,” started teaching them in the 1930s. Harvey developed many distinct fly-tying patterns that are used to this day. He was Humphreys’ mentor, and he helped put central Pennsylvania on the map in terms of fly-fishing. Because of the course at Penn State, national publications such as Life magazine started taking notice of the area. Steve Atanasio grew up on Long Island and is retired from the transportation business that led him to New York City, Boston, and State College. He now lives in Port Matilda and spends a large chunk of his retirement time either fishing or at the TCO Fly Shop talking about fishing. He works at the shop, but he is likely to be there even on days when he is not on the schedule. “Yeah, I like to come in here and shoot the bull. I am always here talking about fishing or whatever,” says Atanasio. “The thing I like about tying flies is that every fly is different, but you always end up at the same spot. You have the tail, the thorax, and the head,” he says. This was a sentiment echoed by many of the fishermen. The camaraderie and friendship that fishermen have is evident. Instead of sitting back with a beer and shooting the breeze, they spend their time talking fish and trying to catch fish, with the occasional beer consumed here and there, for good measure. “Anywhere I go I can talk to people about fishing. All different types of people. It doesn't matter. Man, woman, child, country boy, or city slicker. Fishing ties us together,” says Costa. Galt sometimes dreams about fishing. “I love it that much, that I even dream about it. Especially when I am on a big fishing trip. It is all I can think about,” he says. Tying flies is more than a means to an end for him. “It is a time I can zone out and relax. It is an enjoyable hobby. Anyone can come to our store and buy any number of flies. But, I enjoy the whole process. I am aware of the seasons and the area that I am going to fish. I have to think about what type of hatch might be occurring, and then try to match that with the fly that I am tying.